A modern, relaxed-fit merino wool T-shirt that packs as much style as it does comfort, the Spheria Short Sleeve V features Icebreaker's Cool-Lite™ jersey fabric with an improved drape and softness. 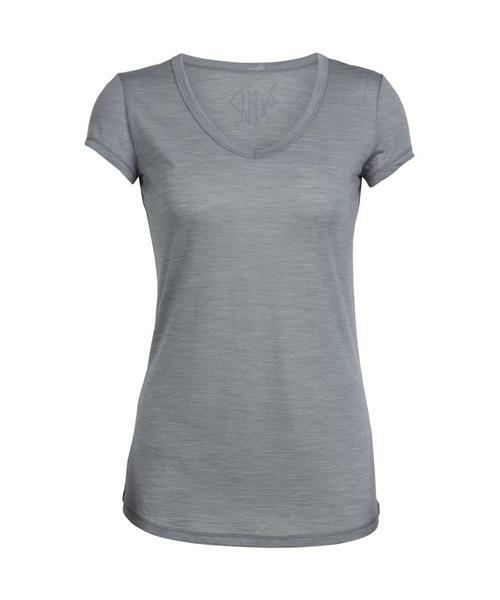 Cool-Lite combines soft, breathable merino wool with natural Tencel®. Their corespun fibers feature a nylon core wrapped in merino wool for added durability that retains next-to-skin softness. The deep scoop neck, ruching shoulder detail and sculpted hem add a feminine touch. Spheria SS V-Neck - Wild Heart Arrow - Womens is rated 4.1 out of 5 by 8. Rated 4 out of 5 by Vlh1696 from Great hiking Tee The light weight is just perfect for base layer and hiking. I'm warm and comfy in it at 8 degrees C. Proviso that our weather is usually relatively cool and I'm climatized. If there is a belt, velcro or other object at waistline, the garment may wear through easily but is still usable. Am being very careful with this purchase. Rated 5 out of 5 by MomandGirl from Nice addition to basic piece of wardrobe Fit true to size with room. I purposely went a size larger for a really loose fit for summer. I got the Heather green color. It is ok - others like it on me. But, it is not a color that you see in too many palettes. Goes well with my darker complexion and naturally going grey hair :-) You can dress the t shirt up or down. I will get my money's worth - recommend!! Rated 2 out of 5 by emdub from Unusual baggy fit I bought this T-shirt online and was sadly disappointed when it arrived because of the baggy fit. It looks like a sack on me... I've bought numerous size L Icebreaker t-shirts over the last 13 years and I've appreciated the consistent, slim fit. Why oh why has Icebreaker now abandoned their typical fit and made no mention of it in the item description? Rated 5 out of 5 by LovemyIB from Best T around! The Spheria is such a comfortable t-shirt. I love the relaxed fit and the longer length. I have several in a variety of colours and they have become my go-to tops. Rated 4 out of 5 by nunrs2005 from Light wt wool, cool and comfortable I like this tshirt except, being small chested, I wish that the V-neck was a wee bit higher. Other than that, this shirt is cool and comfy. Rated 5 out of 5 by Molly123 from Good for the mountain and the city Very comfortable and stylish, loose fitting and nice and long. Good for the outdoors as well as casual wear. Love the (greenish) color. Rated 5 out of 5 by Sylvanna from Great shirt! I like it ! It's ã good design ! The wool is very confortable and we wear many times the colors stay like a new!